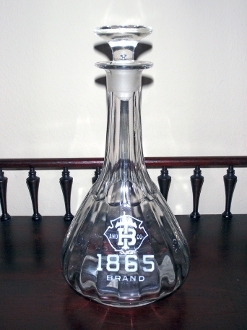 T & B Company 1865 Brand back bar bottle decanter with procelain letters. Nice ribbed neck & body is also ribbed. The stopper has a chip, yet the bottle displays quite nicely. Decanter stands 9" alone & 10 1/2" with stopper. Nice collectible piece.